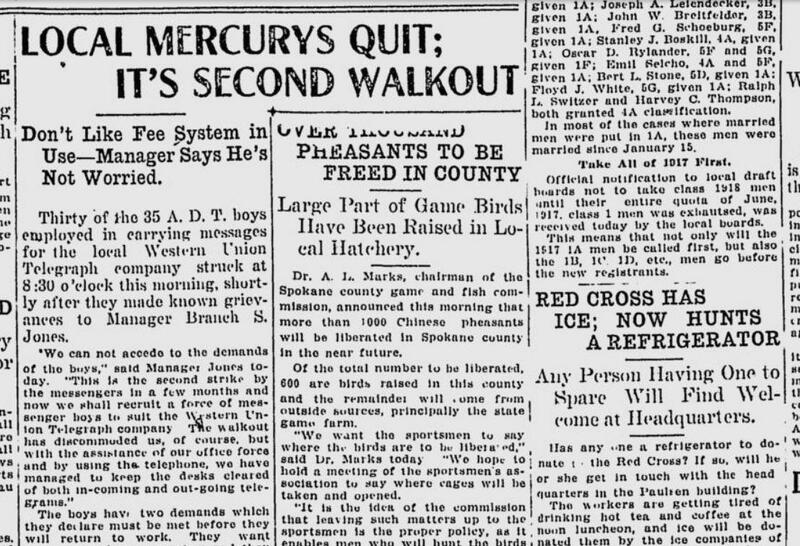 The local “Mercury” boys – telegraph messenger boys – went on strike until the Western Union Co. met their two demands. One of those demands seems a bit jarring to modern ears. The strikers’ other demand was more complex. They wanted changes in the zone system. They were paid more for trips in more distant zones. From the marital beat: A Spokane building contractor was arrested on charges of deserting his wife under the “lazy husband” ordinance, which required men to provide for their wives. He had contributed nothing to her support since he left for Idaho four months before. However, this case posed a dilemma for the judge. The wife had been given $1,100 as a legacy from a relative. The husband and his lawyer claimed the lazy husband law did not apply in this case, since she had not been left destitute. The prosecutor said that was a false argument, since the law never contemplated that a family had to starve before the husband was brought to account. The trial was continuing.